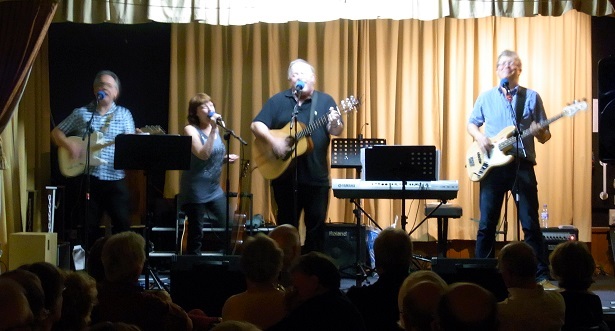 Backwell bounced to live rock, country and pop music on Saturday 14 November. The talented Backwell Trio were ably supported by Take Three - both bands performed a selection of retro and contemporary numbers. Lucy May's captivating vocals rendered an eclectic mix of pop and Les Mis songs which left everyone spell-bound. A fantastic night which raised over £1400 for Wellspring! Huge thanks to everyone who planned and helped at the event - it makes such a difference. And Aimee's Winehouse for loan of glassware. Thank you all! National Diving and Activity Centre in Chepstow where the Wire Zip Slide zoomed them across a water-filled quarry at 40mph to complete their task. Despite some initial hesitance, they all took up the gauntlet and found it a “challenging but stimulating experience”. A big “Thank You” to all the Zippers and their supporters who made the event so successful for Wellspring. at the Tithe Barn, Nailsea. Headlined by Jim Reynolds and Dave Griffiths, an accomplished duo who perform folk, blues, ragtime music which is delivered to perfection and performed with a relaxed and intimate style. Supported by The Channellers, a folk rock band comprising Dave Cox guitar/vocals, John Zinn Sax, Rob Horton Bass and Ian Hyde Drums. All profits went to Wellspring Counselling. This was a unique chance to hear Ian Lavender discuss in his own words what it was like being in one of the UK’s favourite comedies for more than a decade and playing one of our best loved comedy characters - Private Pike in Dad’s Army. Ian was on stage with writer/broadcaster Chris Serle and the evening included favourite clips from the timeless Dad’s Army series, Ian’s career both on television and on stage, plus a special Q&A session where the audience could ask Ian questions. There was even a photo opportunity wearing Private Pike’s scarf for those fans who couldn’t resist. A great evening was had by all, and just over £2,000 was raised for Wellspring. Our concert on 28th September 2013 was a huge success raising just over £2,500 for Wellspring. The Choir and singers from Nailsea Musicals played to a sell-out audience and delighted us with a very popular selection of songs. Grenville Jones, the choir Director, is keen to help raise money for Wellspring; last year his various choirs helped raise over £30,000 for local and national charities. Grenville’s driving passion is to get people of all ages singing and belonging to a group where they can make friends, enjoy themselves and have fun through music. He has appeared on television and radio across the world, most recently on the BBC Children in Need evening with Gareth Malone. Although the weather wasn’t perfect, the Croquet and Pimm’s fundraiser on Friday 14th June was a big success. Tim Brooke-Taylor, our celebrity guest, joined in with enthusiasm and entertained everyone with his asides throughout the evening. The greens were busy, everyone enjoyed the experience and there may have even been a few converts! The final amount raised for Wellspring was £506. With grateful thanks to members of the Nailsea and District Croquet Club for their time and support. Karl works at Wellspring as a supervisor and took two weeks out in May to cycle from Land's End to John O'Groats to raise money for three charities. They are Wellspring Counselling, Gloucestershire Young Carers and Bristol Carers Support. 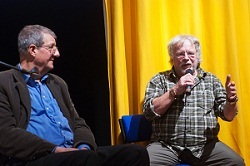 Everyone had a great time when Bill Oddie came to Nailsea in support of Wellspring. Held at Nailsea School, the event started with drinks and a few nibbles. 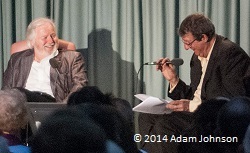 The audience was then treated to entertaining conversation between Bill and Chris Serle, interspersed by some of Bill’s favourite comedy film clips. The following questions and answers spot inevitably touched on another subject close to Bill’s heart – birds and wildlife. The evening raised the fantastic amount of £1,300. Our grateful thanks go to Bill Oddie and Chris Serle for giving their time and making our autumn fundraiser such a huge success. Our thanks also go to all of our supporters and people who helped on the night. Pictured below with Bill and Chris are (l to r) Dr Robin Lambert, Chris Daniels and Rev Mandy Briggs. Ladies at the InShape gym in Nailsea took part in a 12 hour non-stop spin bike challenge, raising £491. Sue rode her trusty steed Mary 1100 miles to raise over £4000 for Wellspring, travelling 50 - 90 miles a day - destination was reached on 7 June.